Living nearly everywhere in the world, most people take squirrels sightings for granted. This common rodent is often seen through the warmer months scuttling up and down trees, across fields, or in some cases, gliding from tree to tree. These little creatures have mighty lives and interesting habits. From where they live to how they live, squirrels have a significant impact on their ecosystem, whether or not they get noticed for it. Our fury and familiar neighbors, they are live among us in most settings. Excellent problem solvers, squirrels thrive in nearly every environment. Squirrels can be found living on almost every continent, except Australia. From the tiniest squirrel, the African pygmy squirrel living in western central Africa, to the flying squirrel living throughout North America, squirrels of one type or another make their homes all over the planet. They prefer temperate locations and avoid the freeze of winter by spending the milder months in spring and summer preparing to bundle up and hunker down during the colder seasons. In such colder climates, since squirrels spend their winter time hidden away from the cold, people often assume that all squirrels hibernate, but this is not the case. It depends on the species and the harshness of the weather conditions. While they do avoid the cold, Tree squirrels do not hibernate. Ground squirrels, though, do hibernate and will spend five to six months tucked away in their burrow or den. Squirrels that stay active during the winter spend most of their time out of the chill, but will venture out to collect hidden food. After all, they’ve been preparing all year for the cold by buying and storing nuts and seeds. Chances are, if you don’t see very many squirrels around lately, they’re just tucked away for most of the day to avoid the cold, either above you in the trees or below in a burrow underground. Tree squirrels may spend a great deal of energy constructing nests, or if they’re lucky, they can save themselves the energy and take over an existing den. When building a new nest using the usual nest items such as leaves, sticks, vines, and other found items, tree squirrels will create the underlying structure and then line it with softer materials like grass or moss. Since this is the winter bed or the place where the babies will spend their first three to four months, great care is taken to ensure a warm and comfortable place. Squirrels preparing to give birth will often build a fresh nest or home for each new litter regardless of the condition of their previous nest. From its exterior, a squirrel’s nest may appear to be just a bundle of leaves within the branches of a tree. Inside, it is a cozy, well-constructed, warm and dry home. 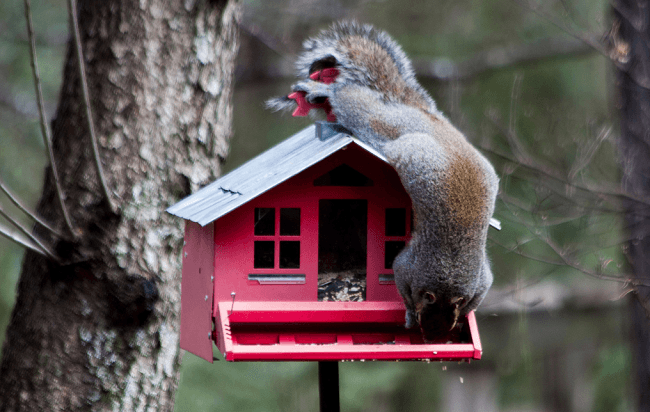 If there are existing nests large enough to accommodate a squirrel and her potential family or his winter bachelor pad, squirrels will have no qualms moving into some other animal’s previous residence. A tree cavity or crow’s nest with all the major assembly completed is ideal for a squirrel that could better use that extra time gathering for an upcoming winter. Squirrels are nothing if not thorough planners. In case of emergency, tree squirrels will have a couple extra nests nearby in reserve. These backup nests may not be as comfortable furnished as a squirrel’s primary residence, but it will do in a pinch when escaping predators or environmental dangers. 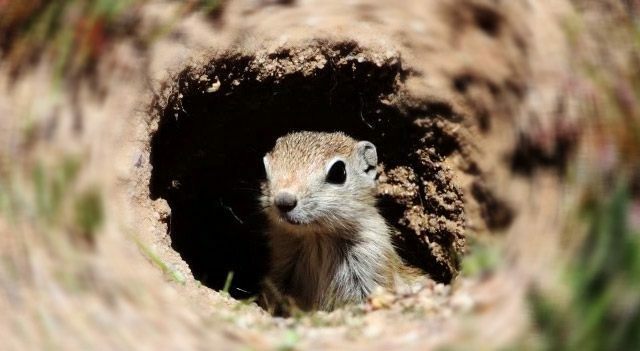 The ground squirrels category that includes other common rodents such as chipmunks, prairie dogs, and marmots, like to burrow into the ground. They live in a variety of habitats. Squirrel dens will vary depending on the specific species of squirrel as well as environmental factors. The thirteen-striped ground squirrel, for example, has a preference for shorter, easily navigated grass. Their burrows will have openings just large enough for the squirrel to pass, somewhere between two to three inches wide, and will have two entrances. Always planning for the attack, an extra exit may come in handy if a predator comes calling. Ground squirrels are as common as tree squirrels. They live all over the world as they are capable of adapting to multiple conditions. For example, the artic squirrel not only can handle the extreme cold of the Alaskan environment, but it has adapted circadian rhythms to handle the constant daylight of the summer months. The flying squirrel is another example of squirrels adapting to live in various environments under various threats. Being able to glide will keep them safer than having to travel by ground. Not to be outdone, though, ground squirrels whistle to other squirrels if danger is present. More like gliding than actual flying, the flying squirrel utilizes skin that extends from their arms along the length of their body and acts as a wing when extended. Rather than flapping, though, a flying squirrel will glide from branch to branch on the air caught under its stretched skin, sometimes as far as 150 feet each glide. As with other tree squirrels, flying squirrels prefer being up in the foliage. They will use a tree cavity, existing nest, or they will construct one of their own. They are not as widespread as other types of squirrels and mostly reside in North America. They are the only nocturnal squirrel. Ground squirrels will likely hibernate if the weather gets cold enough though they can stay active like tree squirrels if the weather is not too harsh. Tree squirrels will certainly sleep most their winter hours away. Anecdotal evidence suggests that occasionally, squirrels sleep with their eyes open. Though tree squirrels won’t hibernate, they will gather together in groups, cuddling up in bundles for warmth during the winter months, fitting as many as two to, however, many can fit—and get along.